We recently looked into installing a solar power system and found the option to be riddled with limitations. That’s not to say we are turned off (LOL) but we are certainly having to make some compromises. Here are a few things we have found out that make installing photo voltaic panels a challenge. Solar panels are an inefficient way of heating water. Photo voltaic panels vary in their output but in conversion of energy for heating water they are less efficient than a water-circulating solar water heater. In the photo voltaic panels solar energy is converted into direct current that is then converted into alternating current that we can use in our normal appliances and lighting. A solar water heater has water in pipes that are directly heated by the sun or reflection. The hot water is pumped or rises to the water tank and is replaced by cold water. The water circulates becoming hotter and hotter the longer sunshine is hitting the pipes somewhere on the heater. Unlike solar voltaic panels a solar water heater can work even if the sun is hitting the water pipes at a low angle. Solar voltaic panels need direct sun or at no less than 30 degree angle. Location and position are everything. 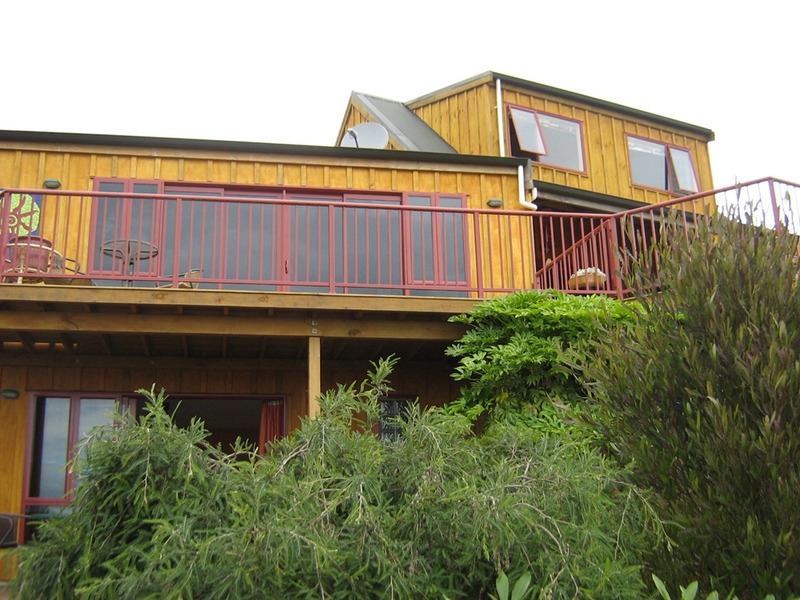 Living on a hill in Golden Bay, which has high sunshine hours and no pollution, we should be ideal for solar panels. Not only do we have no large trees shading the roof, we also have the bonus of a large body of reflective water to up the ante. Unfortunately in the middle of winter our sun is obscured by a slight hill until about 10am. This is when we would really want some input. However, not all is lost, because at the height of the day one roof would be receiving full on sunshine and the other, at a slight westerly angle, would receive sunshine at lesser levels. So position-wise we would be fine. Except that the size of the panels is such that we cannot fit enough of them to cover what we are currently using in electricity. On-the-grid options. If we go ahead with solar we can supplement our power from the power supplier. This means that during times when sunshine is not enough to meet our requirements we can use and be charged by the power supply for the power we use. Conversely, when our solar panels and producing more than we need we can give back to the grid (and store up credits for power we later use). Sounds ideal! But it doesn’t guarantee us continuous power. If the power supply goes down, and it is known to do so in our rural retreat, we lose power even if our solar panels are producing it at the time. The reason is that power company workers will assume they are working with dead lines, and if we’re busily feeding back into the grid – zappo chappo. So the minute the grid goes down our solar energy generation stops too. Off-the-grid options. Ah ha! So what if we went off the grid completely? First, the installation costs are more expensive and we would have to install a large bank of batteries to store enough energy to maintain our household systems when the direct solar input is not enough – at night and on wintery days, of course. From an ecological point of view batteries are not okay. They last about 10 years before they need to be replaced. Then they and their destructive fluids have to be disposed of safely.